If you were expecting anything less than a charming fable with a whole lot of weird built into it, then you won't be disappointed in 'Eleanor and the Egret' #1 from John Layman and Sam Kieth. In classic European style, the story centers appropriately enough around a woman named Eleanor, an art thief in Paris, and her partner in crime is a magical bird, an Egret, who eats the stolen art and expands in size. Layman leaves behind his bold and inventive 'Chew' and returns with something more optimistic and light in the form of a lovely ode to the strange and wondrous. With a love of animals explicitly on its sleeve, 'Eleanor and the Egret' is straightforward fun for readers of all ages. If the 'Thomas Crown Affair' was G-rated it would resemble in some ways this story. The mysterious Eleanor is a talented thief but her motives aren't quite revealed yet. She and her Egret are immensely likable but so is the detective whose job is to recover stolen art. Despite being her foil how can you dislike a guy who confers with his cat for advice? It only made me like him more. Sam Kieth's great designs create visuals that are both warm and articulate. The characters and animals each are designed with their own distinctive appearance providing a depth and personality to each. Backgrounds are sparse but the splashes of color that do appear provide plenty of contrast for the foreground subjects to play against. Ronda Pattison's pastels are the perfect hue to enliven these characters in Layman's elegant world. Add the unconventional layouts and you get an unpredictable storytelling style that keeps the reader on his toes, fully immersed in this classy fantasy. 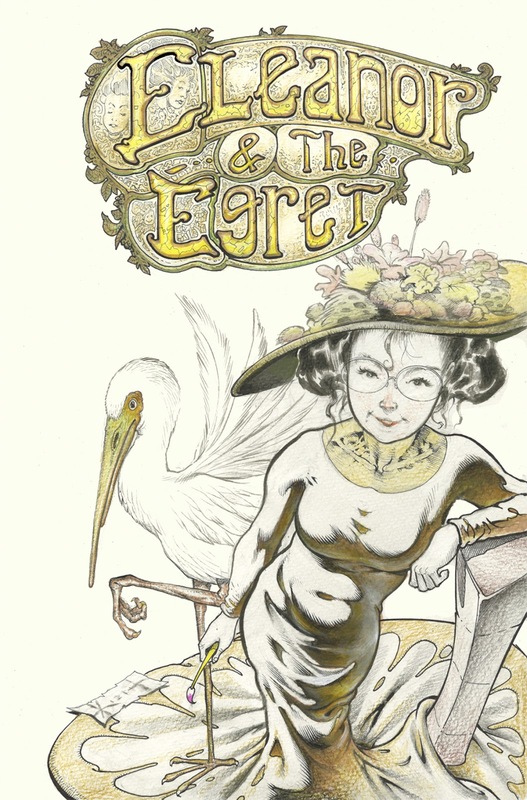 "Eleanor and the Egret" is fun and charming enough to overlook the lack of character development and plotting. It's simply too pretty and enjoyable on its own to fault it for whatever shortcomings it may have. With so much cynism and pretentiousness in the world of comics, it's nice to sit back and enjoy the ride of a story that just fills your dark soul with light and joy.